That doesn’t mean everything went to plan. It didn’t. And that’s probably why it was such a special event. 340 treadwear tires. I was feeling cheap and didn’t want to spend a lot on tires. Having such a slow car, I figured we had no chance at doing well, so why bother with fast rubber? We’re here to do our first 24hr race. It doesn’t matter if we’re competitive. All that matters is we’re there. Unknown brake pads. There aren’t many brake pad options for the Yaris. I’ve had EBC Greenstuff before, and they melted. I had G-loc R10s, but they only lasted 14 hours. So I decided to bring Hawk HPS and EBC Redstuff. There isn’t really anything else unless I get them custom made. The HPS were down to the metal after 8 hours. We thought they would last least 12 hours, but no. So we were a little unprepared to do the brake swap when the car came in. We had no idea how long the Redstuff would last and needed them to go 16 more hours. So we coasted into braking zones, used the gearbox to help decelerate, and scrubbed speed with decreasing radius entries. At the end, we were scraping metal to metal. Inexperience. 4 of our drivers had never driven Buttonwillow before the race. 4 of our drivers had never driven the Yaris. 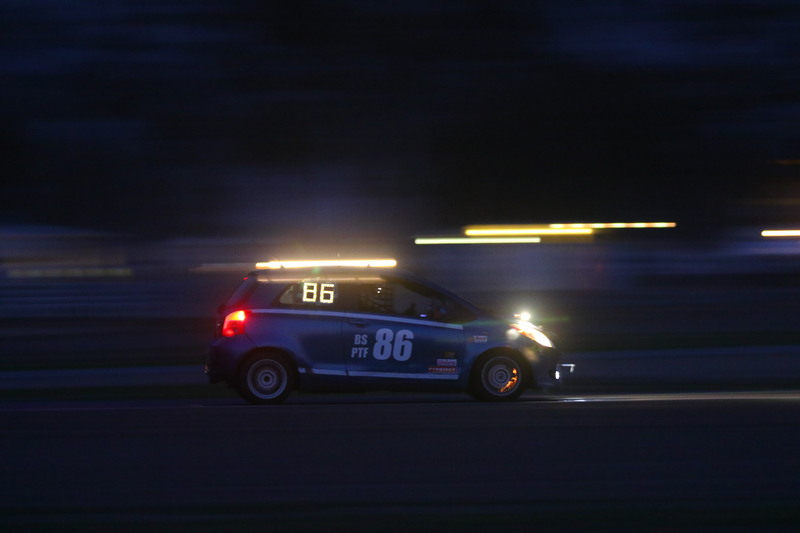 5 of our drivers had never raced at night. 2 of our drivers were on their 2nd wheel-to-wheel race. Street legal. The car is street legal and smog legal. It has the unleaded restrictor in the filler neck. It takes forever to refuel. I think the fastest pit stop was about 10 min. Radios. I don’t know why but the radios hardly ever worked. Live streaming. The live stream from the car was surprisingly robust and was up most of the race. It was fantastic watching the car from the pit or clubhouse. The video below shows my favorite moment of the race. I had just spent the first 90 minutes saving the brake pads and then decided to chase down some faster cars for fun. 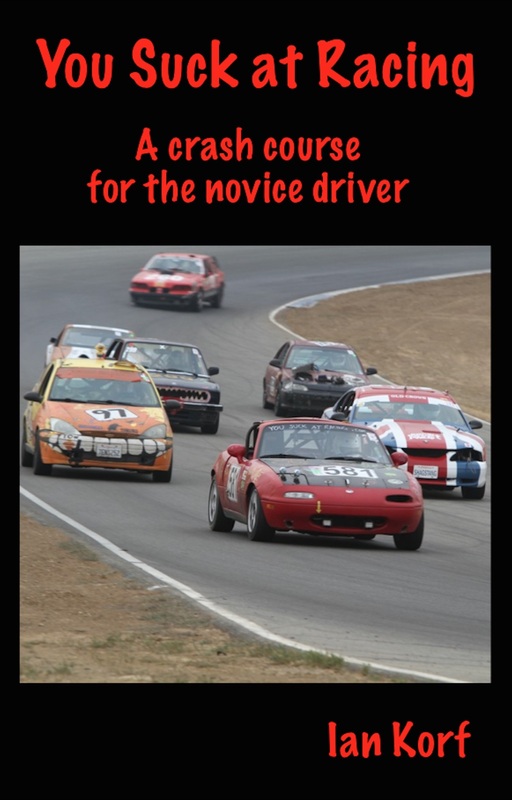 A back-n-forth battle with the race-winning Miata, the 949 Racing Honda, and the Death Race pickup ensued. It ended when I hit the 2 hour limit. Lucky Dog rules state that your car has to be at least 15 years old. Otherwise it goes in the Super Dawg class where the really fast cars can play outside the standard classing. The last time we raced with them, they classed us in the C (slow) class. And that’s the class we ran this race… until we got protested multiple times and sent to Super Dawg. Apparently some other C class cars didn’t like that we were doing so well. Wait a second. We have 100 hp, 2500 lbs with driver, 340 TW tires, fragile brake pads, and insufficient lighting. Apparently that doesn’t mitigate our 2007 model year. The design is basically the Echo, which is from 2001 or something, but heavier. FOR FUCKS SAKE, learn to drive your car. It’s not like we’re racing gods on this team. OK, that’s not quite true. We had Pablo Marx driving with us, and he is a racing god. But that was 1/6 of the team, and the rest of us are mortals. Protesting us was probably the highest form of compliment anyone could have given us, so whoever you are THANK YOU. You have no idea how happy this made us. Oh yeah, we finished 3rd place overall. Congrats to Risky Whiskey on the overall win from the C class. Well deserved. Nice to meet you and your team! What an experience! When I was in the car (E36) during the dawn stint, my teammates told me that we were only 1 lap after you guys, I was so pumped to catch up with you guys. But a stupid spun made me give it back to you. Fun race! It’s my first race and I enjoyed it a lot! Wang, we watched you from the in-car video in club house. You were gaining every lap, until…. Now you have to do it all over again! Yeah, good to see you out there, that was fun. Toofa made a nice showing. I am glad that the video is not from our car, since there were a lot of f words especially during the night driving… Glad we all made it through! Our team has done a bunch of 24s and the Chump 36 in which we place 12th overall. It’s an amazing experience and worth all the effort. You know how to win long races? Stay on the track. You don’t need to be fast, just reliable. I thought you were going to post a bunch of different bitrate video clips? I was going to but got lazy. And in the end, I have to say that my video was not acceptable because of the audio quality. I thought I had set the microphone gain low enough and I had it out of the wind, but it’s just constant noise. Also, the lens on the camera isn’t wide angle enough. Thank goodness we had the livestream. That worked great (although the audio wasn’t very good because of wind). Me too. That was so much fun.